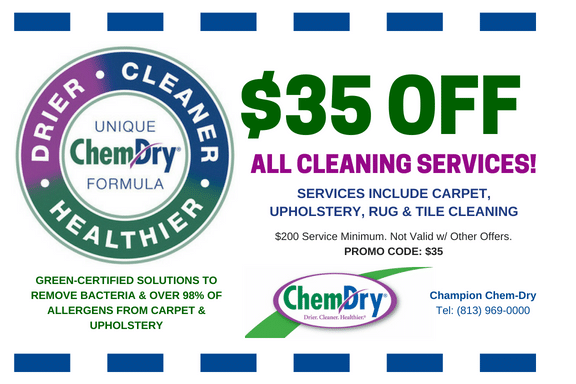 Amazing carpet cleaning specials for Champion Chem-Dry Tampa! Includes coupons for both our Hot Carbonated Extraction and bonnet cleaning methods. 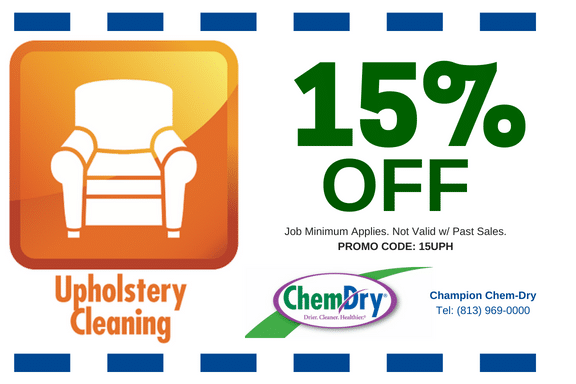 Save money on upholstery cleaning, tile cleaning and rug cleaning too! Learn more about our services. Search our carpet cleaning specials and choose the right one for you and your home. Call (813) 969-0000 and mention the promo code when you schedule your appointment or schedule your appointment online and be sure to add the promo code in the appropriate field. Click here for a free online estimate. Be sure to return for more carpet cleaning specials and information on our services.